Ingenious construction complemented with optimal convenience. This on-bottle wine aerator does it all: serves up a perfect pour, eliminates drips, and fully aerates and oxidates your wine for maximum flavor and quality. Using innovative technology, the vinOair wine aerator has a specially designed, dual venturi chamber that pulls twice the vacuum as other leading aerators to more fully oxygenate your wine (unlocking premium flavors and aromas), while the sleek, compact size makes for effortless portability. Simply place aerator on the mouth of your wine bottle, smoothly pour yourself a glass, and voilà-perfectly oxygenated wine in seconds! Works with both red and white wines. Does this aerator also serve as a stopper? BEST ANSWER: The vinOair Wine Aerator does NOT serve as a stopper as it doesn't seal. No. it does not. It is open on the top. Does this aerator attach to the wine bottle so that it does not fall out while pouring? Yes, it will fit securely in the bottle. 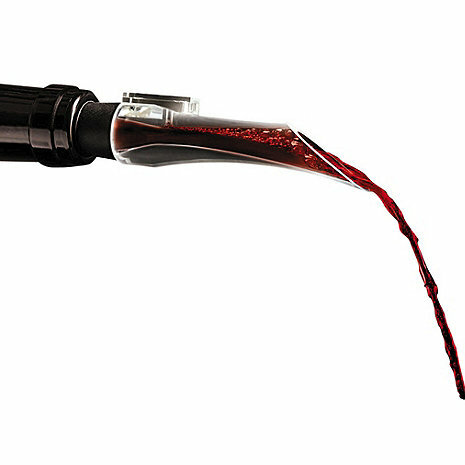 Yes, this aerator helps you pour the wine without any drips. Does the aerator have a filter? BEST ANSWER: The vinOair Wine Aerator does not have a filter. This on-bottle wine aerator serves up a perfect pour, eliminates drips, and fully aerates and oxidates your wine for maximum flavor and quality. No. So if there is sediment in your wine, it might end up in your glass. But I still recommend it. No, there is no filter. But you really don't need a filter with good wine. Does this work on screw top bottles? BEST ANSWER: The vinOair Wine Aerator actually sits inside the mouth of the wine bottle, so it doesn't matter whether it's a screw top or a cork, it will work effectively. I've never used it with a screw top bottle but it should be fine. The unit fits inside the bottle tightly so the ribbed exterior shouldn't affect anything. Can this product be purchased in any store? BEST ANSWER: I could not find it in any other store. Does it work with both red and white wine? BEST ANSWER: Thank you for your inquiry. Yes, this will work for BOTH red and white wines! Yes; the VinOair Wine Aerator works with both red and white wines. Is it made of glass or plastic? Is there any metal that comes in contact with the wine? BEST ANSWER: This aerator is glass and very breakable and no metal at all. It is a plastic with no metal. BEST ANSWER: Hello, thank you for your question. Yes, this aerator is easy to clean. The best method is to run warm, soapy water through the aerator and handwash as necessary. Thanks again. A simple well rinsing with warm water and your ready to go. How do I get a new plastic filter? BEST ANSWER: This pourer is awesome. Better than decanting -- livens the wine. I've bought a few and given them to friends. Do you offer the Vinoair Gift Set? (filter, case, etc.) If so, what is the cost if we purchase 40? also, do you gist wrap? thank you. BEST ANSWER: Thank you for your question, the manufacturer does not provide any information on this item being BPA free, so we believe that it is not. Can one buy just a filter (mine broke) and if so, where? The vinoair wine aerator is small, fits easily into all wine bottles,easy to clean. I did not need to buy any fancy or bulky aerator. This little wonder does the trick. I purchased one aeratorn to see how well it worked, after using product on 2 or 3 bottles of wine, I purcheased a few more. Does everything as advertised. Pleasntly surprised. This product delivered exactly what it advertised. It oxygenated the wine wiht every pour, opening up the nose and intensifying the taste. I was very happy with this product and definitely recommend it to wine lovers. I have another aerator which leaks if not put together right. This aerator is one piece and does not leak. My opinion is this is the best aerator on the market. Easy to use, clean and store! It's a nice simple aerator and very easy to use. I am a simple wine drinker and it's perfect for my subtle palate. This simple device was recommended by a local winery when sampling newly opened bottles. Works great and is easy to use. This is the best! It fully aerates and oxidizes wine in an easy to use ~ one step process and easy to clean! I have two of my own and gave these as gifts! Product works as described. Opens up the flavor and smoothes out the tannins. I have now purchased three of these aerators. Very simple to use and also eliminates drips during the pour. I am using these as gifts to all my wine loving friends. This is not the traditional decanter and time type of wind server. It is however perfect when you want glass NOW! Can't get a better aerator foe the price! Brings out the full flavours and smooths out the wine! Fits well--adjusts to bottle opening size, pours smoothly, and easy to clean. Happy with purchase. Improves the taste of a bottle of wine. Makes a $20.00 bottle taste like a $40.00 bottle. I've been using this handy little device for several years now, and have absolutely loved it! It's simple to use and really gives an inexpensive red a "flavor boost." Bev M.
I've tried different aerators but like this simple small one best. I really like it my wine tastes a whole lot better now it brings out the taste!!! Was replacing an older aerator and this works great. Great to prevent dripping and runs down the bottle. Airator that hits the glass! This product is super because it attaches to the wine bottle and pours like a liquor pourer that is it hits the glass and not the surroundings the glass sits on. The aerator was exactly what I was looking for, great product !!! The aerator works well .... It is easy to use and assures that there is no spillage when pouring. We have had a few Aerators over the years. This one seems to import more “air” which is a little slow however, we can truly taste the difference. An excellent aerator that is compact and easy to carry with you when you are away from home. Don't drop it as it can break the edge on it.